Welcome! I created Checkride or Bust to help fill the void of general aviation blogs out there today. On this site, you’ll find flying adventures and videos, gear and airplane reviews, and training notes. I’m a CFI, aircraft owner, and instrument-rated commercial pilot based out of Tipton, MD (KFME) and Frederick, MD (KFDK). 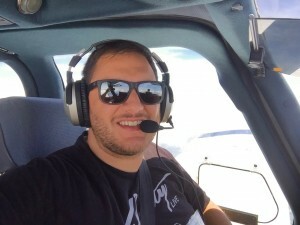 When I was a student pilot, I found a lot of motivation from reading stories of others’ $100 Hamburgers, watching flying videos, and hearing about the challenges I’d get to take on once I got my PPL. That’s what I’m trying to provide here with Checkride or Bust. And by all means, if you’re a pilot in the area, drop me a line! For information on how to get in touch with me for flight training, click here. Cheers! Stumbled on your site while researching the Zulu.2’s. Love to find other Maryland pilots out there. I am your neighbor to the south flying out KVKX in the big bad FRZ! Will be following your site for sure. Always looking for stuff to keep that Flying bug bite itched. I found your blog, I know not how. I happened upon the one about the four must subscribe pilots on youtube when I was watching steveo1kineovo tonight. Not sure how I linked to your blog. I”M GLAD I DID! I will be spending more time here. I’m a 60 year old with Commercial ASEL/AMEL and Instrument ratings. You have some really good insight into some stuff here. I up in PA you neighbor to the north and have a lot of experience flying into and out of FDK before it got the tower. That always made for some interesting experiences. Well thanks for the blog. Later!